The first act of any story is meant to serve as the exposition; this is where the audience is introduced to the setting, main characters, and the issue that will drive the rest of the story. In most films and shows this is done through the narrative by using either dialogue or events within the story that let the audience know what they are watching. Usually this process takes place quickly within the story and only takes up the first fourth of the episode. Although, in The Twilight Zone Serling does not write his first act in the traditional way, instead he employs maybe the most crucial element to what makes his stories work, the narration. Every episode of The Twilight Zone has a narration by Serling where he outright tells the audience who the main character is, the situation they are in, and what the setting for the episode will be. In fact, most of his narrations often seemingly tell the audience most of the plot of the episode right of the bat, but we will discuss this further when we analyze the second act. While most people would accredit this outright narration to being lazy writing that does not want to take the time to develop a way in which to naturally express this information, Serling employs it as a way to combat the biggest difficulty that comes with writing Science fiction. Most of the time when the audience goes into a film or television show they know the general premise or at least the genre. By knowing this information before hand, the audience walks in assuming things about the film or episode before it even starts. While this does not heavily affect the audiences experience in most genres, it actually greatly hinders the Science fiction/mystery genre because the audience goes into the film or episode looking for things that are out of place, causing them to not be shocked when fantastical events occur. Therefore, the writers are tasked with the job of making the story world realistic and captivating enough for the audience to forget the conventions of the genre. Serling is able to circumvent this task by using his outright narration to leave the world building up the audience. By straight up telling the audience the story is about for example, “In 1930, Sally, a 34 year old teacher, questions here career path” each member of the audience uses what they now about the 1930’s, teachers, and being unfulfilled to craft their own version of where the story is taking place and who Sally is. By doing this, the story world feels naturally organic to every viewer because they each are substituting in their own memories of the real world. Ironically, Serling combats audiences having pre-conceived notions by creating a space for them to add even more preconceived notions. Now that the audience feels at peace with the world on screen, Serling is able to introduce the inciting incident and start act two. Act two starts within The Twilight Zone when the first mystical event occurs. When this happens the audience is not only suddenly jolted back into reality with remembering the conventions of the genre they are watching, but also as I mentioned earlier, the plot Serling described in his narration. Now, while it may seem like in some cases Serling ruins the mystique of the story by saying something in his narration like, “Civilization crumbles as the sun and temperatures accelerate” then following it up with a thermometer reading 120 degrees, this actually is meant to misdirect the audience. When Serling outlines the characters and location of the episode he gains the audience’s trust, from there on anything Serling says the audience will believe because they assume he is meant to be the guide for the episode. Serling uses this trust to manipulate the audience’s thought process. By making the audience feel as if they already know the plot they stop looking for any evidence that would suggest otherwise. This makes the audience see the second act as a time to watch the character learn what is going on and not for the audience to try to investigate as well. Right as the audience starts to grow tired of the main character not discovering the “obvious” conclusion that Serling told them, Serling pulls back the curtain and the episode slips into act three. Long before M. Night Shyamalan was infamous for his plot twists, Rod Serling would use the same method to shock viewers in his third act. As previously mentioned, as viewers began to grow tired of the character taking too long to discover the obvious, Serling would flip the story upside and reveal that the story was not actually what the audience assumed it was the entire time. To stick with the last example of the civilization crumbling as the sun moves, while it seems like the reason civilization is crumbling is because the sun is moving closer and burning up the Earth, it is revealed at the end of the episode that the sun is actually moving away and things are freezing and that the idea of the melting Earth was a dream sequence from the main character. As a result of this trick, the audience becomes dumbfounded as to how this could have been transpiring throughout the entire episode without them noticing it and as a result they watch more and more of Serlings stories and fall into the same pitfalls as Serling has clearly exploited the perfect three act structure for Science fiction. Now, while in this article we mostly explored how Serling manipulates the audience by exploring his three-act structure in The Twilight Zone, remnants and variations of this method can be found across all of his works. In Night Gallery, the audience is still given a narration by Serling to set the tone for the episode and in The Planet of the Apes in the third act the audience finds out the film did not take place on an alien planet but on Earth in the future. In conclusion, it is safe to say that Rod Serling may very well have been the best Science fiction writer of all time as he clearly understood how to manipulate his audience to make sure they felt exactly what he wanted them to feel throughout the story. It is a real shame that Serling passed away at age 50 because who knows what else he could have done for the science fiction genre. Please vote below for what your favorite of Rod Serling’s works is and thank you for visiting Celluloid Cinema. 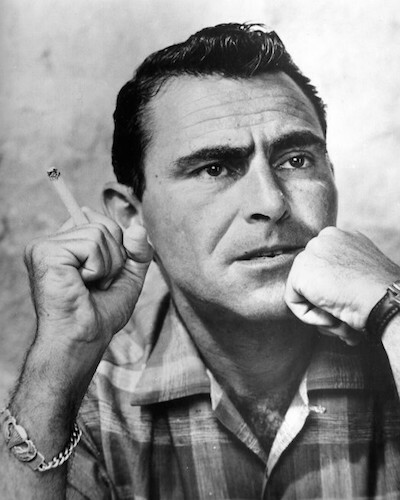 Which of Rod Serling's works is your favorite?